Gaspeite found in 1966 and was initially a discarded by product of nickel sulfide mining. Emotionally, it reduces distress and bring assurance. Aboriginals use Gaspeite to bring visions and grant success. 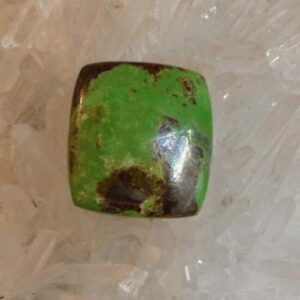 A stone of Freedom, Gaspeite is a gift to Your inner child, it means you have connected with your inner chlld and worked with it. Helps to release past trauma and welcomes you to adulthood. Metaphysically, Gaspeite is best known for helping to bring spirituality into every day life. It brings good fortune and helps prevent loss. Physically Gaspeite has been used for heart problems, lungs and gallbladder. Gaspeite found in 1966 and was initially a discarded by product of nickel sulfide mining.